We’ve all heard the saying.. oh that’s just child’s play! I’ve always believed that children playing and the happy sounds coming from groups of them giggling and having fun is a wonderful sound (may be the former teacher in me coming out a bit). Also as adults – there are many fun and unique games that take us back to the magical times of our youth. What items in your shop relate to child’s play? We’d love to hear your comments and see your items. In my shop I have these adorable vintage buttons that appeal to lots of people, crafters, military buffs, and even button collectors. I found them when I was visiting my sister in Switzerland, I always keep an eye out for the unusual and unique supplies for my shop. My kids and I have done a different kind of Advent calendar every year since I can remember. They are now teens, and we still love to come up with new ideas. This year we did 2, a reverse Advent Calendar, which actually is putting a food item in a box to donate to a family in need on Christmas Eve. The second is more nostalgic. 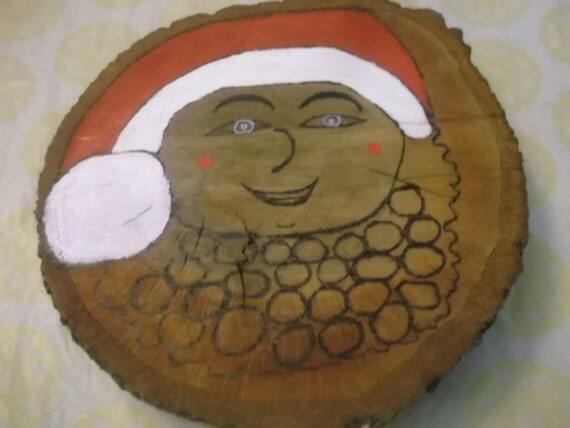 I wood burned, and painted part of Santa, and his beard onto a slice of wood. Then wood burned on 25 circles. Each day we add a cotton ball to a circle, when it is full it is Christmas day. You can use coins, or candy, whatever you like. I hope my children will continue to find joy in doing an Advent Calendar each year. I remember just being fascinated by color(s) and playing matching games with the same hue. When we were kids, we would all sit around the table one night a week and have a family game night! No TV, no computers or internet surfing, just a good fun clean family game night! One of our favorites was Old Maid! I had two loves when I was a kid, reading and cartoons. I still love both! In fact, my daughter caught me watching “Frozen” by myself the other night. Then as a child I found books with cartoons in them and I was truly over the moon. Snoopy was one of my favorite cartoons back in the day. He and his gang are still classics. I remember making bracelets with school friends. Now I find myself making bracelet kits for children 5 to 8 or older, adults too. More colourful kits and designs to come. Our ‘Play’ instant download art celebrates what it means to be a kid and how to stay young at heart as you get older. It’s all about interacting with friends and nature, about being spontaneous and making new discoveries. About having the sun in your face and sand in your toes. About screaming loudly into the wind where it doesn’t bother the grown-ups. Little boys just love trucks! When my oldest son was small, we had to go outside to the alley every time he heard the garbage truck coming. It was such fun to see them pick up and empty the dumpster! I adore all these child play ideas! Hope everyone is having a good new year so far! My memories of childhood is always playing with my gifts and their wrappings far into the new year – we weren’t a wealthy family and the entire gift was always so special to me, I probably have a vintage bow off something from the 1950s to this day. This doll, owl and tea cup set sparked memories of child’s play, I always included my favorite doll and stuffed animal when playing tea set..
Join the Christmas In July team as we celebrate May – New Arrivals. I’ve always wanted to design and craft a line of journals that are completely my own. I feel this series of Fancy Coptic Journals is a step in the right direction. The covers showcase paper that I hand-dyed, yielding unique results, making each book one of a kind. And while the coptic stitch is fairly common, I’ve amended it to show off the spine of the book. One of my closest friends loves tea and many times as we spend time together she will offer me a cup of tea as we share, laugh, cry, or just enjoy each other in silence. As I made the card, I thought of her, “A cup of Tea warms the soul like a good friend”. At the moment I have quite a few friends who are having babies! Havng 2 boys of my own (one of them a baby), thought why not make a baby boy card to welcome a new baby! The card is layered giving it a 3D effect. From a purely practical standpoint, I need to add more get well/encouragement cards to the shop, so that’s one reason I made this. On a more creative level, though, I love to work with vintage photos and images of people from bygone times and imagine what they might be thinking, especially if their expression is very prim and proper. This particular image, I think, is from a website called The Graphics Fairy and it’s one of a set of Victorian Shakespearean images of Shakespeare heroines. I did notice that Lady Macbeth is not included in this set (lol) and if you know the play, you’ll understand why. I like to use vintage style patterned papers to evoke that mood of a time past, hence my choice of the red and white paper used here-the red pattern is actually flocked onto the paper so it’s raised and feels very nice. Adds a little extra touch. Though I do other work that I don’t usually sell on Etsy, I always, always come back to doing these cards because I enjoy them. I had this idea of including a compass on a graduation card. I like the idea of pointing to the right direction after graduation and finding a way through life. A graduation is a start for that, isn’t it? My daughter will graduate from high school next year, so this topic is currently close to me. I love making things for children. Although my shop is for everyone, I have a special love for creating things for babies and children. I love making frames that can either be picture frames or decorations all by themselves. I would love to have people come see what I do as I also love browsing other’s shops! With this set of postcards you will be able to congratulate all the members of your family or friends. Сolorful handmade card will please anyone. I make them in spring and summer and let all the warmth of this seasons be transferred to your close people on winter evenings. Lately I have become an addict to make these pouches with amigurumi. My little daughter loves them and uses the first one that I made to keep her “castañuelas” that she uses in Spanish dancing class. Now all her friends want one for themselves! I love creating these and they are so useful, always looking through my stash of fabric to find a combo that I like. It’s very, very warm here, it seems Summer has already arrived! And I prefer rainy days and cold weather! I’m always thinking about Christmas, especially in Spring-Summer. It’s one of my Happy thoughts! I’m sewing some Christmas items and I’m listening to ‘Have Yourself a merry Little Christmas’ sung by Judy Garland in ‘Meet me in St. Louis’. Don’t you just love the Scandinavian feel of all these stockings? They remind me of the handknitted jumpers my mother used to knit when we were kids. Sadly my knitting skills are not up to making them in wool so this advent calendar in cotton will have to be my new favourite instead! I have started to ramp up my Christmas listings already. This charming pillow cover is made with a section of one of my antique postcards and adds just the right vintage touch to the upcoming holiday season decorating. Actually I think it is charming enough to leave out for the entire winter season. Soft and cuddly the pillow cover is made from velveteen – ahh, just perfect to cuddle with on those cold winter nights (yup, those cold nights will return). I love vintage items and when I found this sweet honey bee pattern, I just had to embroider it! I picked a new fabric for the back that had a mod style to it which adds to the retro feel. It would be a lovely spring and summer decor item and would be a fabulous gift for a bee collector or gardener. I love all vintage things and summer dresses are high on my list to love. This seersucker sundress is so typical of the 1950’s 1960’s . Beautifully made and so perfect for summer. I believe this skirt was a custom made piece, it’s so extremely well done. The fabric is so rich with eyelet ruffles and silver eagles. I found this skirt in Thrift store in Palm Spring, CA. I love this soft organic cotton for spring and summer hats. I designed this hat using the common fan pattern striped in such a way to produce the ever popular chevron pattern. The muted colors complement each other and the style and texture remind me of Victorian era fashion. Newbie today: I have a new couching foot for my long arm sewing machine. My VAST stock (hoard is my hubby’s word for this pile) of sari silk ribbon works so well with it. The result of my silk and huge pile of pics of the local sunset over Lake Michigan. Starting off the summer with some newly created wreaths. This one is a great way to honor the USA in your home! I have had this ancient Roman coin showing the image of Roman empress Julia Domna on one side and Roman goddess Diana on the other. As I love to set ancient coins in my sterling silver rings, I have set it in a predesigned ring I made for the coin and decorated it with a hammered. silver thread. I believe that mainly women can wear it with pride. There’s something about the quiet, yet elegant simplicity of antique white china bowls. Found recently in a Victorian estate sale, these beautiful bowls celebrated many a holiday meal with family. This cute little bowl is made using the pinching method – I love making pinch pots because they are very intimate and hands on, and the shape of the finished bowl reflects the shape of the makers hand…. it is almost a document in clay! I also love pinch pots because they are very organic, and the green glaze used on this bowl serves to heighten this natural feel. estate sale in Nevada County, Ca. Amazing find! This was originally a custom order made for one of my regular customers. I was really happy when she asked me to do it. When I took the picture of the whole order I saw it and I thought, well that is a very good spring set! This items was inspired by Fishing trips with granddad! It’s a great keepsake / valet box. Most celebrate this holiday by holding a celebration,an awards ceremony or having sales for teachers. There is so much we can all do to show the teachers of the world we appreciate them and their hard work and dedication to teaching our young ones. As a child I moved frequently and therefore went to many different schools in several different states. I don’t remember the names of a lot of my teachers but I do remember what I loved about my favorite teachers. They engaged you in class, encouraged free speech and really listened to what you had to say. They pushed you to think about things in a different way, expected a lot of you and in response you stepped up to that challenge. To all of my wonderful teachers I would give them an A+! I was always a very shy little girl. I had one teacher that showed me it was ok to be just me. A red haired overweight child. She gave me all the confidence I needed to go on to succeed. I would give her this. In 8th grade my History Teacher acted like no other teacher I had ever seen. He would get on his desk sometimes to make a speech like a famous historical figure. He would get ‘in character’ by changing his voice and act like a war hero from the past. You never knew what he would do. He made learning fun for our class and kept us all interested. Here’s to you Mr. W—–. Ms. Cummins was my high school math teacher as a freshman and then again in calculus as a senior. I had the privilege of having some very good teachers, but she holds a special place in my heart. As a sophomore, I had a very troubling summer and decided to drop my honors class in math. While she clearly expressed what a ridiculous idea this was, she also supported me the following year, spending hours helping me get caught back up. As a result of her help and her confidence in me, I was able to get through that class. When she presented me an award at Baccalaureate, we were both tearing up. When she found out I couldn’t afford a calculator for college (they were really expensive back in the day), she said she needed some help around the house. I washed her car and found a new calculator in the back seat. I only hope I am as inspirational to my students as she was to me. You see, she is the reason I became a teacher. Science, though, not math. Here’s to you, Ms. Cummins! Congratulations on helping me through! I hope I make you proud! I went to high school in England, and for both my O levels and A levels I had the same teacher for maths. He was patient, passionate and talented. Maths soon became my favorite subject. I stayed on at school for an extra few weeks after the end of school to prepare for the entrance exams for the university I wanted to attend, once again, he was there to help me. It was during this time that he revealed to the class of 4 or 5 students that while he was at college he had worked as a grave digger. Now, 30 some years on, I think of him every time I write the phrase ‘thank you for your interest in my coffins’ in response to a convo about my coffins. loved science. My favorites were biology, chemistry (1 and 2), and physics! I had great teachers for all of them, but my favorite was an older gentleman who volunteered to help us. He worked on the atom bombs when he was younger, after he retired he wanted to still be involved in science so he contacted our high school to volunteer. He was always there to praise us, help explain stuff to us, or to tell us stories. He was super patient with us when we didn’t quite get it. He was strict if we gave him attitude, but you could tell he still cared. He came to the school Monday, Wednesday, and Fridays and was there from my freshman to senior year. His love of science made it come alive to me. My freshman year in college I had a wonderful intro to literature instructor. She was so down to earth, in touch with what was going on in the world and super smart . She was so passionate about teaching and that was evident. I learned so much from her and always got excited for the next class. Dr. C gave me the confidence to embrace difficulties and challenges, twenty years later I still remember how influential she was and still is… I would not be who I am if it was not for her! I would gift her this anchor pill box, perfect since she was my anchor during a time I had no confidence or idea of what or whom I was … Good teachers make an impact and that she did! I am a teacher, and I know I wouldn’t be half the teacher I am without my wonderful mentor and professor, Dr. Foster. He inspired me to think outside the box. He challenged me to question how to teach close reading. He showed me that plays are meant to be performed, not read for homework. He helped me see how to teach classic literature and young adult literature. I know I owe most of my career to him. He was still so in touch with what happens in the classroom. This wreath reminds me of him. It’s bright and vibrant, just like his teaching. He always loved things that were a little wacky! He still teaches at my university, and we keep in touch via Facebook. I hope wherever you are that you give a little something back to those that have done so much!